With more courses than any other state and weather that allows for year-round play, Florida is a dream destination for golfers. Ready to go fore it? Florida is a world leader in golfing terms – there are over 1000 courses, many of which feature prominently in the lists of America’s best. Add to this the remarkable climate that has led to Florida being named ‘The Sunshine State’, and it is obvious to see why it is such a popular holiday hot spot. While golf and sun are constants in Florida, the state’s respective regions each offer a distinctive experience making it quite easy to find something that suits your game. Families are drawn towards the bright lights and attractions of Orlando, where the Walt Disney Resort, Universal Studios and Sea World are perfect for kids young and old. Alternatively, the beaches around Miami, the prestigious communities of Palm Beach and Fort Lauderdale, and the charming coastline around Jacksonville each attract thousands of golfing visitors to their championship courses and world class resorts. For a more relaxing Florida experience, the Gulf coast around Tampa has emerged as a fantastic option, exuding the charm and essential hospitality that makes Florida the annual choice of so many visitors. Which region will you choose next? Golf Guides USA recently visited Florida's 1st Coast, an area in the northeast part of the state. 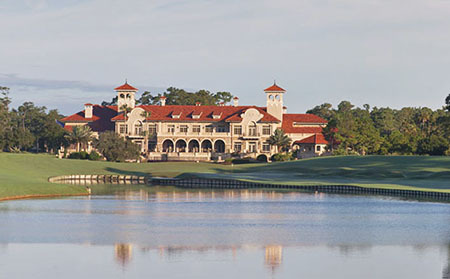 It included Amelia Island, St. Augustine and the World Golf Village and Hall of Fame. A wonderful vacation coupled with some fabulous golf...click here to see the full feature story.